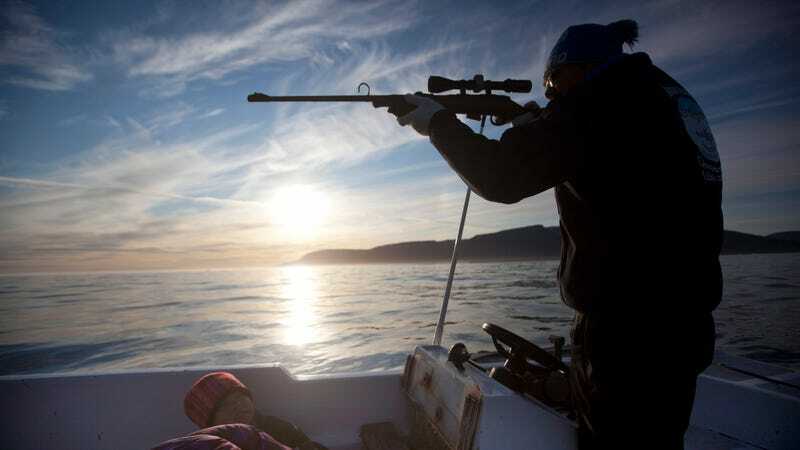 An Inuit hunter takes aim at a seal from a boat off the coast of Greenland. It’s a time-honored tradition going back centuries: When sunlight returns to the Arctic each spring, the men of East Greenland hitch up their dog sleds and head out onto the frozen ocean to hunt polar bears. But over the past few decades everything’s changed. The weather in East Greenland is warmer and less predictable, the sea ice more treacherous. The bears seem to be changing their behavior, too. And the Inuit people whose food security and culture is deeply intertwined with these majestic predators are being forced to adapt. These are the conclusions of a new research paper published in Frontiers in Marine Science, which interviewed 25 Inuit polar bear hunters living in East Greenland about how the bears, the hunt, and the climate of their Arctic homeland are changing. It’s part of a growing body of research that draws on traditional knowledge to understand profound changes happening in the Arctic. There are 19 subpopulations of polar bears scattered across the north. While some are in decline as sea ice loss affects their migration routes and makes it harder for them to catch a meal, the bears ranging across the vast and remote coastline of East Greenland are largely a mystery. “We don’t know how many there are,” Kristin Laidre, an Arctic biologist at the University of Washington and lead author on the new study, told Earther. That lack of basic knowledge not only limits what we can say about the bears and climate change, but also the scientific advice to help improve food security in the region. The new study looked to fill that gap by turning to native communities that rely on animals, and are often more in tune with their well-being than anyone else. Researchers interviewed hunters from two East Greenland settlements—Ittoqqortoormiit and Tasiilaq—on everything from weather and climate to hunting strategies to polar bear behavior, and how all of the above have changed over the last 15 years. The responses confirm that the people of East Greenland are living the impacts of climate change today. A large majority of hunters described a dramatic loss of sea ice, an increase in warm, stormy weather, and rapidly disappearing glaciers. Many noted how the thinning and weakening of sea ice has impacted the polar bear hunt, which traditionally involved travel by dogsled. Hunters from both communities also noted more polar bears coming near their towns than before, a change that may be due to a loss of sea ice, an increase in polar bear numbers, or some combination of those factors. In other areas, data show that polar bears are spending more time on shore as sea ice recedes. Laidre said information from the study will be provided to management authorities who set polar bear hunting quotas, which were established across Greenland in 2006 without any formal scientific assessments of polar bear numbers in East Greenland. Olivia Lee, a marine ecologist at the University of Alaska, was thrilled to see the study incorporate traditional knowledge into polar bear science. In Alaska, she noted, native hunting communities have played an important role in improving quotas for subsistence bowhead whale harvesting, all the while making major contributions to science. She sees this fusing of knowledge systems as part of a growing trend among younger academic researchers. “I think the younger generations are certainly a lot more interested in how to combine these two knowledge systems and how to use it for long term studies like climate change where we haven’t done a lot of observation,” Lee told Earther. This study has fostered community ties that are helping advance other areas of polar bear research, too. Since 2015, Laidre has been engaged in a larger polar bear population assessment across East Greenland. So far, she says, hunters have proven very useful in helping scientists figure out where they should be looking for bears.